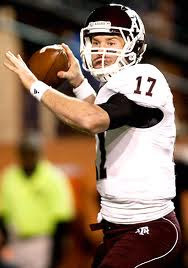 The Aggies went on a tear last year thanks to the sudden becoming of Ryan Tannehill. 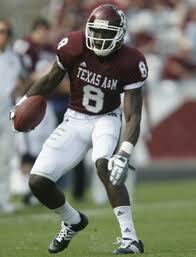 Star Jerrod Johnson went down and then Tannehill filled in and became a the star. Now with Tannehill Jeff Fuller will even become better. Fuller's got great hands and has a big frame. He's flanked by junior Uzoma Nwachuku both great options for Tannehill. Cyrus Gray is the man of the backfield. He can run over you or he has some speed. The backfield is also helped by juniors Christine Michael and Bradley Stephens. Tight end Nehemiah Hicks returns from his freshmen year with a whole lot of skill. The offensive line is good, thanks to guards Brian Thomas and Patrick Lewis. The defense is good even with the loss of linebacker/end Von Miller. Miller isn't flashy but he had skills. Linebacker Michael Hodges was also very good. The defensive line is good with tackle Jonathan Mathis. Even without Miller and Hodges the linebacker postition is great with Garrick Williams and Sean Porter. The secondary is the strongest part of the line. Much of it thanks to cornerback Coryell Judie and safety Trent Hunter. Both are seniors and experienced a lot. The special teams is great thanks to senior kicker Randy Bullock.